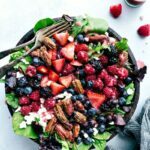 Delicious berry salad with candied pecans and an incredible raspberry vinaigrette! In a mixing bowl, whip together the egg whites, water, and vanilla until frothy. In a separate bowl, mix together sugar, salt, and cinnamon. Toss together the spring mix, strawberries, blueberries, raspberries, and blackberries. Toss to combine. Add the feta cheese after adding the dressing. Combine all of the ingredients except for the oil in a blender or food processor. Pulse until the ingredients are well combined. Slowly add in the oil in a steady stream. Blend until emulsified and smooth. This dressing is supposed to be pretty thick -- when you toss it with the salad it does thin out a little with the juices from the salad ingredients. Toss the dressing and candied pecans with the salad. Only dress and add pecans to what you will eat because leftovers don't do so well! Add feta cheese last. You can store the salad, pecans, feta, and dressing separately for delicious leftovers!